Few things have the power to connect us like laughter. It can heal, teach, point out injustice and hypocrisy, and break down barriers between us. With nothing more than a guitar and his razor-sharp wit, Jonnie W. has delighted audiences nationwide. More than just another comedy show, he blends music and traditional standup for a multimedia comedy experience not to be missed. Every now and again, Jonnie likes to pay his mortgage and even eat a meal or two. “How can I help?” you may ask. Well, I’ll tell you. Hire Jonnie for your next event, and you won’t just be feeding your mind, you’ll be feeding Jonnie. Visit Jonnie W.’s website here. Hello friends! Clayburn Cox here. Thank you so much for your interest in my comedy and storytelling. If you’ve ever seen me on stage, you’ve probably noticed that I keep my comedy extremely clean. As you might imagine, this isn’t necessarily always popular. Unfortunately, many comedians (who are very talented) sometimes employ absolutely filthy material. And to be honest, their acts may get bigger laughs than mine. However, regardless of my desire for audience approval, I never want to compromise my convictions for a few laughs. Why is it important that I keep my act so clean? Jesus has made me clean. Don’t get me wrong; I’m far from perfect. I have sinned and I’ve done things that I regret. There hasn’t been one day of my life that I’ve lived perfectly. However, God loves me despite my sins. He has forgiven me of my sins and cleansed my filthy heart. He loves you and wants to forgive you too! See Videos of Clayburn Cox here. Mike was born again at a New Year’s Eve service in 1998. Ironically, a New Year’s Eve service was also the birthplace of Comedian Mike Goodwin. Mike opened for Comedian Akintunde that night in 2002 and he has been leaving his mark ever since. 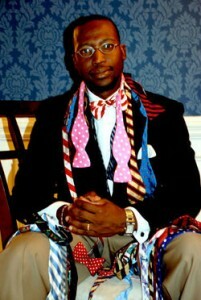 A Camden, South Carolina native, Mike is the oldest of three children. Mike entered the United States Army after graduating from Camden High School in 1993. After four years of service, Mike exited active duty to enroll into Lander University in Greenwood, SC. At Lander, Mike was very involved on campus, and the seeds of comedy were planted. Mike hosted a myriad of events, and he also served as a student ambassador of the college. Mike was also initiated into the Gamma Nu chapter of Kappa Alpha Psi and he is a charter member of the Omicron Nu chapter. Mike graduated from Lander University with a BS in Political Science in 2001. 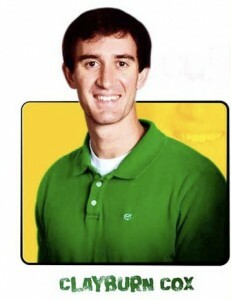 He also graduated from the University of South Carolina with a Master of Education in 2003. Mike also served in the US Army Reserves as a commissioned officer. Mike incorporates his life experience into his roles as a comedian, writer and motivational speaker. Mike and his beautiful wife Rozalynn, and their daughter and son live in Columbia, South Carolina, where he also serves as an Elder at Right Direction Church International. …Good laughs are guaranteed and you’ll be laughing about his wit long after the show. He’s serious about God and seriously funny. Oh yeah – For the record: he’s not a Muslim. He just likes bowties. These are some videos of one of the top Christian Comedians, Thor Ramsey. 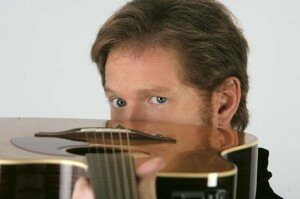 Youtube clips here of Christian Comedian Tim Hawkins. Want clean comedy with an edge? Tim Hawkins brings the funny. Tim Hawkins is a crowd pleaser for sure! In November 2007, Tim decided to test the “Google concept” and give away his comedy for free online. Within 2 years, his music videos and stand-up clips had received over 50,000,000 views on YouTube and Facebook alone. Fan favorites include “The Government Can”, “Cletus Take the Reel”, “Chick-fil-A”, “A Homeschool Family”, and “Things You Don’t Say To Your Wife”. Hawkins has 3 DVDs available: “I’m No Rockstar” (2008), “Bananas II” (2008), and “Full Range of Motion” (2006), as well as 3 CDs of comedy parodies and originals. His current DVD project, “Tim Hawkins Rockshow Comedy Tour”, includes comedian friends John Branyan and Bob Smiley and is scheduled for release November 2010. Comedy that doesn't make you feel like you stepped in something. Thor Ramsey is a standup comedian and first-time author, which he is hoping to parley into a career of walking from the bed to his laptop. He is best known for the best-selling “Thou Shalt Laugh” DVDs and the Sony-owned comedy series “Bananas,” which he hosts. His first book A Comedian’s Guide to Theology (Regal Books) is in stores now or you can order it at Amazon. He is grateful to everyone who supports comedy that doesn’t make you feel like you stepped in something. It doesn’t matter that Thor Ramsey happens to work clean. He’s funny. And funny is the thing that matters when you’re watching a comedian. So, he followed her dream! Thor began his comedy career playing the basement lounge of a Ramada Inn in Des Moines, Iowa. (Because if you can make it in Iowa, you can make it anywhere — in Nebraska.) The Ramada’s basement ceiling was so low you could touch it while standing on the stage. Since he’d reached the pinnacle of showbiz in Des Moines, he moved to Chicago. Soon he was working forty-two weeks a year at major comedy clubs around the country. Then he moved close enough to Los Angeles to say that he lives there (but not according to the Post Office). His smart, sometimes loud and often opinionated brand of comedy has made him an audience favorite nationwide. Marty became a follower of Jesus in the tenth grade. He was 16 years old and followed a girl that invited him, to a Young Life meeting. After dating this girl for 4 months, he had heard a lot of talks about this Jesus person. He got to be close with the Young Life leader in Columbia, South Carolina at the time. On a trip to Destin, Florida with his youth group, which included this girl that dragged him to Young Life, Marty was truly shown the gospel. In August, later that same year, Marty prayed to receive the Lord in his heart. He gave his testimony in front of hundreds of his classmates at a Young Life retreat called “Windy Gap.” He had been praying for a sign from God to prove to himself that his relationship with Him was real. Marty believed having to stand up for his faith in front of his classmates was indeed this sign. Marty cried while talking in front of the group. He was overwhelmed with emotion while talking about his Young Life leader. So much so, that many students where impacted for the gospel that day. Most folks reading this will not understand the significance of what happened next, but those in Columbia, South Carolina in the 1980’s probably will remember. Just one week after giving his testimony about his relationship with Jesus, and then questioning it upon arriving home, Marty Simpson was fortunate enough to kick the game winning field goal in the 1988 AAAA State Championship game against nationally ranked Gaffney High School. Simpson's game winning field goal to win the State Championship. Simpson was yelling, "Thank you Jesus!" Marty said later that the entire run down the field after making the walk off, 3 to 0, winning kick, he was yelling praise God, thank you, Jesus, the whole way! You can see video of this kick here. Marty then went on to play football for the University of South Carolina, where he continued his journey with Jesus. After a six month struggle with finding himself his freshmen year, while God spared him from any seriously regrettable mistakes, Marty rededicated his life to the Lord. It was through an emotional roller coaster of football that Marty started feeling convicted that athletes tended to only show their love for God after touchdowns or after great plays. Marty resolved himself that he would commit to hitting a knee and praying a prayer of thanks after each “attempted” field goal, instead of after each made kick. A shot of the 46 yard field vs. East Carolina. Notice the rain soaked lense. Shown here on a punt that was down inside the 5 yard line. Showing the rainy weather conditions. 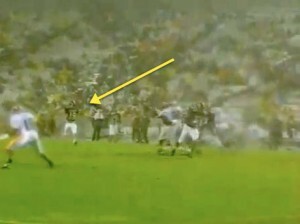 So, Marty trotted back out to the field, having given thanks to the Lord for his “missed” field goal attempt. Marty said later that he truly felt like God had blessed him with the perfect opportunity to glorify Him in a time of adversity, and then spared him from the actual adversity. However, that would not prove to be entirely true. Now, with the clock set at 2 seconds, Simpson lined up again for another 38 yard field goal. 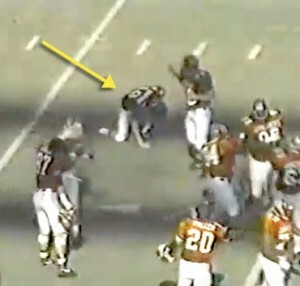 (Simpson’s roommate had taken the ball back to the original line of scrimmage after recovering it.) The snap was perfect, the hold was perfect, but this time, Simpson’s left foot slid about 12 inches in the ground as the water mounted up on the field, and the kick sailed 30-40 feet wide to the right. 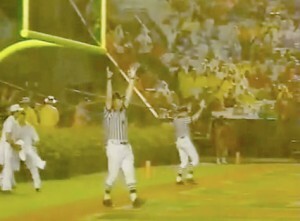 Shown here after a 4th quarter win-sealing 38 yard field goal versus the previous year's national champion Georgia Tech Yellow Jackets. Gamecocks won 23-14. The newspaper the next morning had a large picture of Simpson on one knee praying. Except the caption read, “Simpson sulks with teammates.” Simpson was scheduled to give his testimony at a large church in Columbia that very next morning. He held that picture of the paper up and showed it to the kids and told them that he was not sulking, but that he was praising God. He explained how the newspaper didn’t even ask him what he was doing. 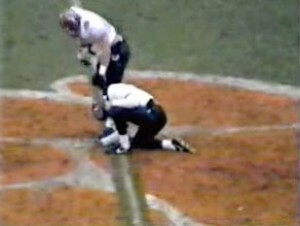 Shown here praying on the Clemson paw after a made 43 yard field goal. Simpson has maintained since 1992, that adversity in athletics is what provides the means for Christian athletes to bring glory to the Father while playing competively. Marty Simpson is one of our top Christian Comedians. He has a number of videos on YouTube, and we have chosen to feature a few of those for your viewing pleasure. So if you are interested in taking a look at one of our top Christian Comedians, be sure to check out Marty Simpson’s videos.